Their battle for his heart. His struggle for their soul. Lucy, Cecilia and Agnes find themselves in the emergency room of a Brooklyn hospital at their lowest point. All rebels running from their past lives and themselves, plagued by broken hearts and broken dreams. He brings each of them what they long for... but in he battle for his heart, will they lose their souls? Well. This book was... memorable. You've probably already guessed by reading the blurb that The Blessed is quite a dark book. To be honest, I was really reluctant to start this one. I don't think it was because of all the goth vibes it gives out - it was more due to the fact that I'd buy some other, more known, book and read it. Plus, most of the reviews I read for this one were quite negative. 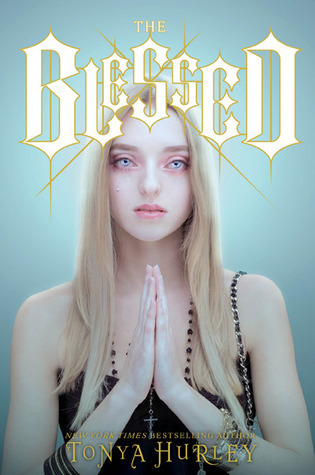 I'm really glad the UK has a different cover for The Blessed. The original creeps me out. A lot. I'm not even going to show you it, but if you really want to see, be my guest: creepy cover. Personally, I think the cover I've posted above is much nicer than the one in the link. With all that in mine, I wasn't sure I'd like the book once I started it. It wasn't bad in the beginning. In fact I was pretty determined to get more than 80 pages read, because I remember seeing a review where the person only got as far as 80 pages. Perhaps that's what drove me to finish it - I just wanted to prove to myself that I could.It takes place in Brooklyn, and I don't think I've ever read a book set there. It was for that reason I found myself wanting to actually enjoy the book. 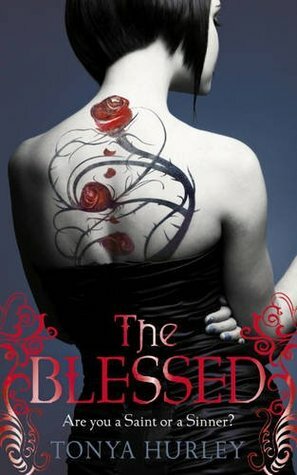 One thing that I did manage to love about The Blessed was Tonya Hurley's style of writing. At times it did lag a bit, but her writing techniques are really clever. I don't think we see enough of descriptive techniques in YA novels sometimes. I still love them, though. The characters Hurley created seem too much like adults. They're all meant to be about 16-18, but with the things they go through and they way they handle situations, I just couldn't imagine them as their age. I'm pretty sure that no teenager I know goes through things like that. So, I was reading this at night, before bed. And then it started to get scary. And I started to get scared. There was like, demonic possession stuff going on. To call it creepy would be an understatement. However, I actually found the plot OK. It was enjoyable at times. Rare, rare times. I don't think I'll forget how scared I got. I get scared really easily. I think that the book was paced too slowly for my taste. If the author had only sped things up, the book wouldn't have been as lengthy and it wouldn't have dragged. If dark, gothic novels are your type, then by all means, read this. It's actually quite clever. Nevertheless, the book wasn't for me. 2/5 stars - My bookish thoughts were so scared and creeped out.
" A child believes. In magic. In fairies. In monsters. Faith is knowledge. Certainty. Without it, we fail."